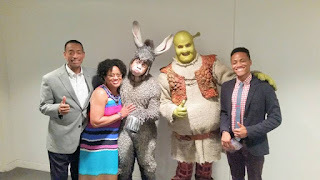 We are back from Singapore.Watching our son on stage in the role of Donkey in the Broadway Musical “Shrek” was an unforgettable experience.Parental pride ruled the day.As luck would have it, we were able to spend some down time at Universal Studios Singapore.Of course, we made our way to the Shrek Experience.I thought the ride was underwhelming.The colors were muted with a dark feel, almost eerie.It seemed joyless unlike the movie.Universal Studios missed the boat on this attraction.Half-way through the ride I realized I had my sunglasses on.Shrek and Lord Farquhar’s vibrant colors became clear.My face alighted with a huge smile when I realized that the hilarious mischief and hijinks had been there all along.With eyes uncovered, I could see the true essence of what the Shrek Experience had to offer. Sequels are ubiquitous. There are blockbuster movies, books and concerts done in series. In the entertainment business if it was phenomenal the first time around, then expect a sequel. A few blog post back, I used a web image of a painter using his mouth to paint. This is a sequel. Today I am in Athens, Georgia for a wedding and what did I see this weekend? A young man injured as a child who creates pieces of art. A donation bucket sat at his feet. The funds were designated for replenishing paint and supplies. 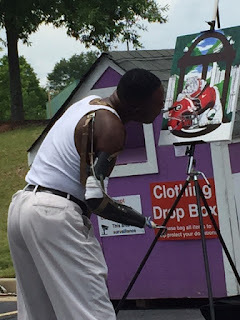 In the heat of the day, year in and year out this arm less artist can be found on the same corner painting . Throughout scripture, God repeats Himself. Either the lesson was so vital to our understanding it needed to be reiterated or in His divine wisdom He knew we would not comprehend the meaning the first time. God is into sequels. We really can as the scripture states do all things.